Complex multicellular organisms require rapid and accurate transmission of information among cells and tissues and tight coordination of distant functions. In vertebrates, electrical signals and the resulting intracellular calcium transients control contraction of muscle, secretion of hormones, sensation of the environment, processing of information in the brain, and output from the brain to peripheral tissues. In nonexcitable cells, calcium transients signal many key cellular events, including secretion, gene expression, and cell division. In epithelial cells, huge ion fluxes are conducted across tissue boundaries. All of these physiological processes are mediated in part by members of the voltage-gated ion channel protein superfamily (Fig. 1) (Yu and Catterall, 2004). This protein superfamily of more than 140 members is one of the largest groups of signal transduction proteins, and many family members are the molecular targets for toxins and therapeutic agents. Here we review the molecular and evolutionary relationships among the families within the voltage-gated-like (VGL1) ion channel superfamily. The architectures of the ion channel families consist of four variations built upon a common pore-forming structural theme. The founding members of this superfamily are the voltage-gated sodium channels (NaV; Fig. 1) (Agnew et al., 1980; Beneski and Catterall, 1980; Catterall, 1984, 2000a). Their principal α subunits are composed of four homologous domains (I-IV) that form the common structural motif for this family (Noda et al., 1984, 1986) (Fig. 2). Each domain contains six probable transmembrane α-helices (termed segments S1-S6) with a membrane-reentrant loop between the S5 and S6 segments (Guy and Seetharamulu, 1986). Structural analysis by high-resolution electron microscopy and image reconstruction show that the four homologous domains surround a central pore and suggest laterally oriented entry ports in each domain for transit of extracellular ions toward the central pore (Sato et al., 2001) (Fig. 2). Voltage-gated calcium (CaV) channels have a similar structure (Fig. 1). Voltage-gated potassium (KV) channels, first identified as the gene encoding the Shaker mutation in the fruit fly Drosophila, exemplify the second structural architecture in the ion channel superfamily. They are composed of tetramers of α subunits that each resemble one homologous domain of sodium and calcium channels (Fig. 1) (Papazian et al., 1987; Tempel et al., 1987; Pongs et al., 1988). Several other families of ion channels also have this architecture, including calcium-activated potassium (KCa) channels, cyclic nucleotide-gated (CNG) and hyperpolarization-activated cyclic nucleotide-modulated (HCN) channels, and transient receptor potential (TRP) channels (Fig. 1 and see below). The inwardly rectifying potassium channels comprise the simplest structural motif in the ion channel protein superfamily. They are complexes of four subunits that each have only two transmembrane segments, termed M1 and M2, which are analogous in structure and function to the S5 and S6 segments of voltage-gated sodium, calcium, and potassium channels (Kir; Fig. 1) (Ho et al., 1993; Kubo et al., 1993). Two of these pore motifs are linked together to generate the two-pore motif potassium channels (K2P), the fourth structural architecture (K2P; Fig. 1) (Goldstein et al., 1996; Lesage et al., 1996). The functional elements of the ion channel superfamily of proteins can be divided into three complementary aspects: ion conductance, pore gating, and regulation. The ion-conducting pore and selectivity filter (Hille, 1972) of the six-transmembrane (TM) segment channels are formed by their S5 and S6 segments and the membrane-reentrant pore loop (P) between them (Noda et al., 1989; Striessnig et al., 1990; MacKinnon and Yellen, 1990; Hartmann et al., 1991; Yellen et al., 1991; Yool and Schwarz, 1991; Lopez et al., 1994; Ragsdale et al., 1994; Hockerman et al., 1995) (Fig. 2A). The analogous M1 and M2 segments and pore loop form the complete transmembrane structure of the 2TM potassium channels (Ho et al., 1993; Kubo et al., 1993). X-ray crystallographic analysis of the three-dimensional structure of a 2TM bacterial potassium channel (KcsA), analogous in overall topology to the inwardly rectifying potassium channels, reveals an “inverted teepee” arrangement of the M1 and M2 segments in a square array around a central pore (Fig. 3A) (Doyle et al., 1998). The narrow outer mouth of the pore is formed by the intervening membrane-reentrant pore loop. This structure is cradled in a cone formed by the tilted M1 and M2 transmembrane segments, with the M2 segments lining most of the inner pore surrounded by the M1 segments. A cavity in the center of the structure is water-filled and contains permeating potassium ions. The pore appears to be constricted at the intracellular end by crossing of the M2 α-helices. Representation of the amino acid relationships of the minimal pore regions of the voltage-gated ion channel superfamily. This global view of the 143 members of the structurally related ion channel genes highlights seven groups of ion channel families and their membrane topologies. Four-domain channels (CaV and NaV) are shown as blue branches, potassium-selective channels are shown as red branches, cyclic nucleotide-gated channels are shown as magenta branches, and TRP and related channels are shown as green branches. Background colors separate the ion channel proteins into related groups: light blue, CaV and NaV; light green, TRP channels; light red, potassium channels, except KV10-12, which have a cyclic nucleotide binding domain and are more closely related to CNG and HCN channels; light orange, KV10-12 channels and cyclic nucleotide-modulated CNG and HCN channels. Minimal pore regions bounded by the transmembrane segments M1/S5 and M2/S6 were aligned by ClustalX (Thompson et al., 1997) and refined manually. The pore regions of the fourth homologous domain of NaV and CaV channels, the second domain of the two-pore channels (TPC), and the first pore regions of the K2P channels were used to assemble the alignment, and an unrooted consensus tree was built by minimum evolution analysis using PAUP version 4.0b10 software (Swofford, 2003). To confirm the significance of the relationship among the families that comprise the VGL ion channel superfamily, we tested the significance of the amino acid sequence relationships using the HMM searching procedure. HMM searches of the complete RefSeq database revealed that each ion channel family profile identified another family of voltage-gated-like ion channels as the nearest relative in amino acid sequence of its pore. For example, for the KV channel profile, the nearest neighbor was CNGA1 (HMM e-value of 2.6 × 10-3); for the cyclic nucleotide-modulated channel profile, KV11.2 (HMM e-value of 1.5 × 10-6); for the TRP channel profile, CaV3.1 (HMM e-value of 1.8 × 10-3); and for the NaV/CaV profile, CatSper (HMM e-value of 9.4 × 10-6). The e-value is a measure of the number of hits from HMM searches that would be expected by chance; values less than 1.0 indicate a highly significant amino acid sequence relationship to the probe profile (Yu and Catterall, 2004). Structure of voltage-gated sodium channels. Left, schematic representation of the sodium channel α subunit. Roman numerals indicate the homologous domains. The α-helical transmembrane segments S5 and S6 and the pore loop region between them are highlighted in green. The positively charged S4 segments are highlighted in red. The inactivation gate with the isoleucine-phenylalanine-methionine-threonine (IFMT) motif that is crucial for inactivation is highlighted in yellow. The probable N-linked glycosylation sites are indicated by Ψ. The circles in the reentrant loops in each domain represent the amino acids that form the ion selectivity filter (the outer rings have the sequence EEDD and inner rings DEKA) (Noda et al., 1989; Heinemann et al., 1992, 2003). Right, three-dimensional structure of the NaV channel α subunit at 20 Å resolution, compiled from electron micrograph reconstructions. Adapted from Sato et al. (2001) and Yu and Catterall (2004). Insight into gating of the pore has come from structural and functional experiments. Biophysical studies revealed gated access of substituted amine blockers to the pore from the intracellular side of voltage-gated sodium and potassium channels (Armstrong, 1975; Hille, 1977; Liu et al., 1997). The M2 α-helices are bent at a highly conserved glycine residue in the three-dimensional structure of a bacterial 2TM calcium-activated potassium channel (MthK; Fig. 3A) analyzed in its calcium-bound, presumably activated form (Jiang et al., 2002a,b). This bend appears to open the intracellular mouth of the pore sufficiently to allow permeation of ions. Substitution of proline for this glycine, which would greatly favor the bent conformation, dramatically enhances activation and slows pore closure of a bacterial sodium channel, providing functional evidence for bending at this position as a key step in opening the pore (Zhao et al., 2004). The addition of the S1 to S4 segments to the pore structure in the NaV, CaV, and KV channels confers voltage-dependent pore opening. Although the mechanism of voltage-dependent gating is unknown in detail, an overall view of the process has emerged from a combination of biophysical, mutagenesis, and structural studies. 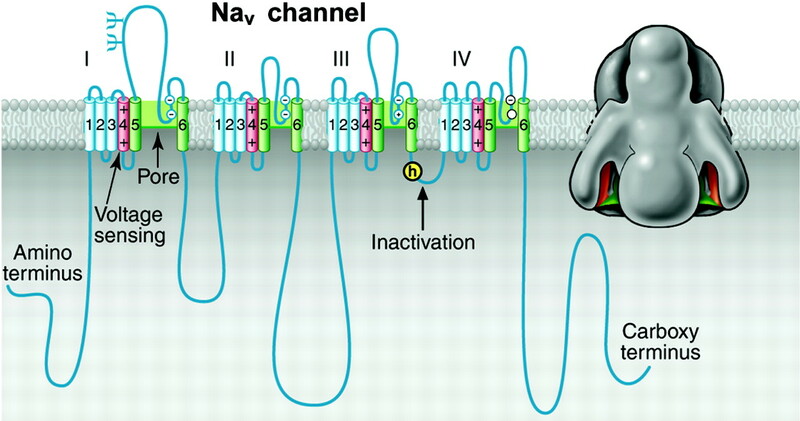 The movement of charged amino acid residues associated with NaV and KV channel gating (gating currents) (Armstrong, 1981) are consistent with outward translocation of approximately 12 positive charges during channel activation (Schoppa et al., 1992; Hirschberg et al., 1995; Bezanilla, 2000). The S4 segments, which have repeated motifs of one positively charged amino acid residue followed by two hydrophobic residues, are thought to serve as the primary voltage sensors (Catterall, 1986; Guy and Seetharamulu, 1986). Mutations of these charged amino acid residues have large effects on gating (Stuhmer et al., 1989; Papazian et al., 1991; Bezanilla, 2000). The outward movement and rotation of these S4 segments has been observed directly by studies of state-dependent chemical modification and by fluorescent labeling of substituted cysteine residues (Yang and Horn, 1995; Larsson et al., 1996; Cha et al., 1999; Glauner et al., 1999; Bezanilla, 2000). Most structure-function studies support a spiral or rotational motion of the S4 or S3 plus S4 α-helices through the channel protein, perhaps together with movements of the surrounding protein structure, to move gating charges across the membrane electric field (Catterall, 1986; Guy and Seetharamulu, 1986; Bezanilla, 2000). In contrast, a strikingly different sweeping transmembrane paddle movement of these S1 through S4 α-helices from the intracellular surface of the membrane through the surrounding membrane lipid is suggested from the X-ray crystal structure of a bacterial KV channel in complex with antibody and detergent (Jiang et al., 2003). Further structural and functional experiments will be required to resolve these two distinct views of voltage sensor movements during gating. Structures of potassium channels. A, open and closed conformations of the potassium channel pore structures. 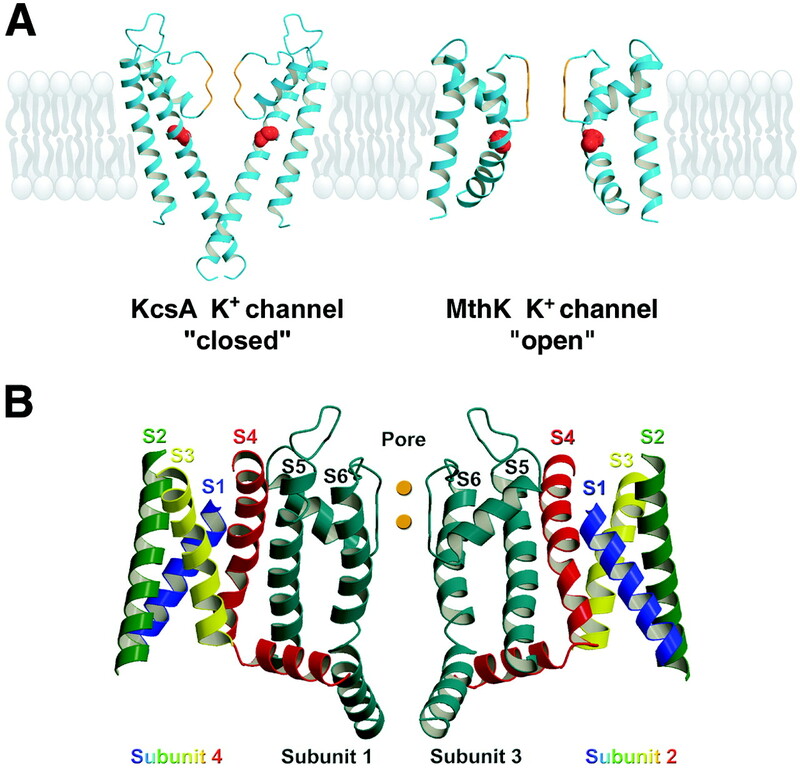 Two subunits of the bacterial K+ channels of KcsA (Doyle et al., 1998), representing a “closed” conformation, and MthK (Jiang et al., 2002b), representing an “open” conformation, are shown in the figure. The selectivity filter is orange, and the outer helix (M1) is depicted adjacent to the lipid bilayer. The inner helix (M2) is marked with a space-filling model of the conserved glycine residue (red), which is thought to be critical for the bending of the M2 helix in the open conformation. B, cross-section through the three-dimensional structure of a tetrameric KV1.2 channel (Long et al., 2005a,b). Center, the pore regions S5-P-S6 of two subunits, designated 1 and 3, in blue-green. Left, S1 through S4 of subunit 4, whose S5-P-S6 segments project in front of the plane of the figure and form the near side of the pore. Right, S1 through S4 segments of subunit 2, whose S5-P-S6 segments project behind the plane of the figure and form the far side of the pore. As illustrated, the voltage-sensing domain composed of the S1 to S4 segments is positioned to interact with the S5-P-S6 segments of the adjacent subunit located clockwise (as seen from the extracellular side) in the symmetrical tetrameric array. A recent X-ray crystal structure of a vertebrate potassium channel (KV1.2) (Long et al., 2005a,b) cocrystallized in its open conformation with its CaVβ subunits but without antibodies or other interacting proteins is a major advance in understanding the structure of the voltage-gated ion channels because it reveals the conformation of the S1 through S4 segments and their mode of interaction with the pore in the activated state, as illustrated in a cross-section through the channel tetramer in Fig. 3B. All of the S1 to S4 α-helices are in transmembrane positions, as expected from previous structural modeling studies. The S3 and S4 segments interact closely with each other and may function as a gating unit in moving gating charge across the membrane. As illustrated in Fig. 3B, the voltage-sensing S1 to S4 segments (left and right, in multicolor) form a bundle that interacts with the pore-forming S5-P-S6 segments from the adjacent subunit (center, in blue green), situated in the clockwise direction as viewed from the extracellular side. These two separate structural elements within each subunit are connected by the long S4-S5 linker, which runs along the intracellular surface of the channel. This structure requires that pore gating is an interactive process in which adjacent subunits interact intimately and further suggests an important role for the S4-S5 linker that connects the two structural elements of each subunit. The addition of regulatory domains to the carboxyl terminus of 2TM Kir channels and 6TM calcium-activated potassium (KCa), CNG, and HCN channels (Fig. 1) yields gating by binding of small intracellular ligands such as calcium, ATP, and cyclic nucleotides or by interactions with protein ligands (Zagotta and Siegelbaum, 1996; Ashcroft and Gribble, 1998; Vergara et al., 1998; Biel et al., 1999). Ligand binding to these domains is thought to exert a torque on the S6 segments that opens the pore by bending them (Jiang et al., 2001, 2002b; Schumacher et al., 2001). For KCa and HCN family members, ligand binding and membrane depolarization act in concert to open the pore (Vergara et al., 1998; Biel et al., 2002). The four-domain CaV channels have regulatory sites in their C-terminal intracellular segments that may exert a similar torque on the S6 segment in domain IV and modulate the opening of the pore in response to membrane depolarization (Catterall, 2000b). We built profiles based on hidden Markov models (HMMs) of each ion channel family (Fig. 1) (Yu and Catterall, 2004) using the sequences corresponding to the minimal pore structure (i.e., the pore loop and the flanking M1/S5 and M2/S6 transmembrane segments). We interrogated the nonredundant protein database, RefSeq of the National Center for Biotechnology Information, using each HMM profile (Yu et al., 2004). This search revealed 143 genes that encode related ion channel proteins. The amino acid sequence relationships of their minimal pore structures are illustrated in Fig. 1. We found 21 proteins related to four-domain NaV and CaV channels; two novel two-domain relatives of ion channel proteins (TPC); 90 proteins related to one-domain voltage-gated potassium channels, including 40 KV channels, eight calcium-activated potassium (KCa) channels, 10 CNG and HCN channels, and 32 TRP channels and relatives; and 30 proteins related to the Kir and K2P channels. We verified that these families are members of a common superfamily by determining their nearest neighbors in amino acid sequence space (see legend to Fig. 1). In each case, the closest molecular relative is a family within the VGL ion channel superfamily, and the relation is highly significant. How did the structural motifs of this large ion channel superfamily arise in evolution? Although the answer to this question is necessarily speculative, some insight can be gleaned by comparing ion channels in different species. Many bacteria have 2TM potassium channels resembling Kir channels, and some bacteria have 6TM voltage-gated potassium channels (Booth et al., 2003). Thus, it is possible that the primordial members of this superfamily were 2TM bacterial potassium channels. Addition of the S1 to S4 segments to this founding pore structure yielded voltage-gated potassium channels in bacteria. Bacteria also contain a novel 6TM sodium channel with only a single homologous domain that functions as a tetramer like a potassium channel (Ren et al., 2001). This channel has striking similarities to vertebrate sodium and calcium channels and a homolog may be their ancestor. The simplest organism expressing a four-domain calcium channel is yeast, which has a single calcium channel gene (De Hertogh et al., 2002). To date, only multicellular organisms have been found to express four-domain sodium channels, including jellyfish, cnidarians, squid, and fruit fly (but not the roundworm Caenorhabditis elegans) (Loughney et al., 1989; Sato and Matsumoto, 1992; Anderson et al., 1993; Nagahora et al., 2000). These four-domain channels may have arisen by two cycles of gene duplication and fusion from an ancestral bacterial one-domain sodium channel. Because of their ancient origins, the ion channel genes are spread throughout the genome. Only the late-evolving four-domain sodium channels have a large fraction (5 of the 10 family members) in a single cluster on chromosome 2. The pattern of spread of the sodium channel genes among chromosomes has been correlated with the spread of homeobox genes during the vertebrate radiation, suggesting that similar chromosomal dynamics affected both gene families (Plummer and Meisler, 1999). In contrast, most of the other ion channel genes were probably sorted to distinct chromosomes much earlier in evolution. 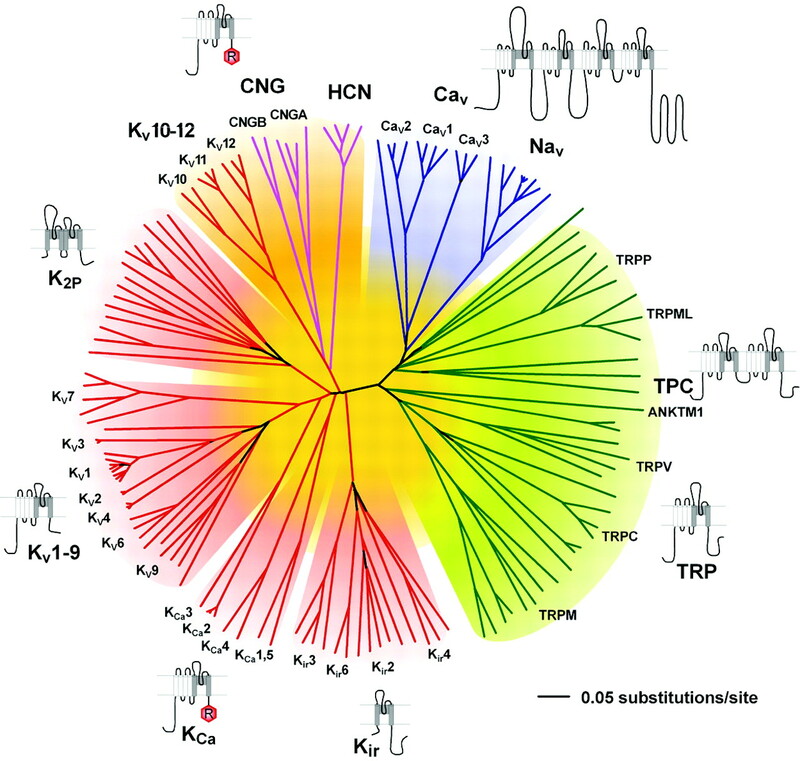 A closer look at the phylogenetic tree for potassium channels (Fig. 1) shows that the KV1 to KV9 channels form one closely related cluster. Within the KV1-9 cluster, the KV14 channels form one related group, the KV5, 6, 8, and 9 channels a second related group, and the KV7 channels (formerly KCNQ or KVLQT) form a third more distant group of KV channels. Surprisingly, the CNG, HCN, and KV10-12 channels form a distinct cluster when the molecular relationships are determined by comparison of pore-forming sequences (Fig. 1). These channels also share an actual or potential cyclic nucleotide-binding motif in their C-terminal domains. Evidently, these channels arose from a common evolutionary pathway despite their diversity of ion selectivity (K+, Ca2+, or nonselective cation channels) and primary gating mechanism (voltage, cyclic nucleotides, or both). An additional surprise is the clear distinction between sequences of the KCa channels and the KV channels in the S5, P, and S6 segments (Fig. 1). Evidently, these two groups of channels with similar transmembrane topologies and voltage-dependent gating separated from each other early in evolution, and their pore domains have become quite distinct in amino acid sequence. Positioned adjacent to these clusters of 6TM channels are the Kir channels, which appear to have evolved earlier (Fig. 1). In contrast, the K2P channel cluster leaves the main branch of the tree later than some of the 6TM potassium channel clusters, suggesting the possibility of a later appearance in evolution. The principal pore-forming subunits of the voltage-gated ion channels and their structural relatives are primarily responsible for their characteristic gating, selective ion conductance, and regulation by second messenger signaling and pharmacological agents. However, many of these principal subunits are associated with auxiliary subunits that modify their expression, functional properties, and subcellular localization (Isom et al., 1994). This section briefly reviews the structure, function, and genetic relationships of the known auxiliary subunits. Purification and characterization of sodium channels provided the first evidence for ion channel auxiliary subunits (Catterall, 1984). Sodium channels have a single family of auxiliary subunits, NaVβ1 to NaVβ4, which interact with the different α subunits and alter their physiological properties and subcellular localization. These proteins have a single transmembrane segment, a large N-terminal extracellular domain that is homologous in structure to a variable chain (V-type) immunoglobulin-like fold, and a short C-terminal intracellular segment (Fig. 4) (Isom et al., 1992, 1995; Morgan et al., 2000; Yu et al., 2003). The NaVβ subunits interact with α subunits through their extracellular Ig-fold domains, modulate α subunit function, and enhance their cell surface expression (McCormick et al., 1999). Like other proteins with an extracellular Ig-fold, they also serve as cell adhesion molecules by interacting with extracellular matrix proteins, cell adhesion molecules, and cytoskeletal linker proteins (Srinivasan et al., 1998; Ratcliffe et al., 2000, 2001; Kazarinova-Noyes et al., 2001; Malhotra et al., 2002). A mutation in a conserved cysteine in the Ig-fold of the NaVβ1 subunit causes familial epilepsy (Wallace et al., 1998). The NaVβ subunits are a recent evolutionary addition to the family of ion channel associated proteins, as they have only been identified in vertebrates. CaV channels have up to four distinct auxiliary subunits, CaVα2, CaVβ, CaVγ, and CaVδ (Fig. 4) (Takahashi et al., 1987), each of which comprise a small protein family. The CaVα2 and CaVδ subunits are encoded by the same gene (Ellis et al., 1988), whose translation product is proteolytically cleaved and disulfide linked to yield the mature extracellular α2 subunit glycoprotein of 140 kDa and transmembrane disulfide-linked δ subunit glycoprotein of 27 kDa (De Jongh et al., 1990). Four CaVα2δ genes are known (Arikkath and Campbell, 2003). The four CaVβ subunits are all intracellular proteins with a common pattern of α-helical and unstructured segments (Ruth et al., 1989; Arikkath and Campbell, 2003). They have important regulatory effects on cell surface expression, and they also modulate the gating of calcium channels, causing enhanced activation upon depolarization and altered rate and voltage dependence of inactivation (Arikkath and Campbell, 2003). Recent structural modeling and X-ray crystallography studies have revealed that these subunits contain conserved Src homology 3 and guanylate kinase domains like the membrane-associated guanylate kinase family of scaffolding proteins (Chen et al., 2004; Opatowsky et al., 2004; McGee et al., 2004; Takahashi et al., 2004; Van Petegem et al., 2004) and therefore may interact with other intracellular proteins. Eight CaVγ subunit genes encode glycoproteins with four transmembrane segments (Jay et al., 1990; Arikkath and Campbell, 2003). Although the CaVγ1 subunit is associated specifically with skeletal muscle CaV1.1 channels, other CaVγ subunits interact with other calcium channels and glutamate receptors and possibly with other membrane signaling proteins (Arikkath and Campbell, 2003). Thus, the γ subunits discovered as components of calcium channels apparently have a more widespread role in assembly and cell surface expression of other membrane signaling proteins. Auxiliary subunits of the VGL ion channel superfamily. The transmembrane folding patterns of the auxiliary subunits of the VGL ion channel superfamily are illustrated, with cylinders representing predicted α-helices. Note that the intracellular and extracellular sides of the proteins are oriented in opposite directions for the top and bottom membranes, as in a cell. N-linked carbohydrate chains are indicated by Ψ. The intracellular auxiliary subunits are illustrated by their predicted or directly determined three-dimensional structures (Yu and Catterall, 2004). KV1 channels are often associated with an intracellular KVβ subunit (KVβ1-3; Fig. 4) (Scott et al., 1993; Rettig et al., 1994; Pongs et al., 1999), which interacts with the N-terminal T1 domain and forms a symmetric tetramer on the intracellular surface of the channels (Gulbis et al., 2000). The three KVβ subunits are superficially similar to the CaVβ subunits in their cytoplasmic location but are not related in amino acid sequence or structure. The N terminus of KVβ subunits of vertebrates serves as an inactivation gate for KV1 α subunits (Pongs et al., 1999) and is thought to enter the pore and block it during sustained channel opening (Zhou et al., 2001). This is a unique example of a direct physical role for an auxiliary subunit in channel gating, rather than modulation of the gating process of its associated pore-forming α subunit. KV4 channels interact with the K channel interacting proteins KChIP1-4, which are members of the neuronal calcium sensor family of calmodulin-like calcium regulatory proteins and have four EF-hand motifs (Fig. 4) (An et al., 2000). The KChIPs enhance expression of KV4 channels and modify their functional properties by binding to a site in the intracellular T1 domain, similar to the interaction of KVβ subunits with KV1 channels. The KV7, KV10, and KV11 channels associate with a different type of auxiliary subunit—the minK-like subunits (Fig. 4). These five closely related proteins have a single transmembrane segment and small extracellular and intracellular domains (Takumi et al., 1988; Abbott et al., 2001b). Although these subunits are topologically similar to NaVβ and CaVδ subunits, they do not have significant amino acid sequence similarity. The minK-like subunits are important regulators of KV7 channel function (Barhanin et al., 1996; Sanguinetti et al., 1996), and mutations in one of these auxiliary subunits causes a form of familial long QT syndrome, which predisposes individuals to dangerous cardiac arrhythmias (Abbott et al., 2001a). In addition, recent work indicates that these subunits also associate with KV3 and KV4 channels and are responsible for a form of inherited periodic paralysis (Abbott et al., 2001a; Zhang et al., 2001). In light of this work, it is possible that all KV channels associate with minK-related subunits. If this hypothesis is true, the KV channels would then resemble the NaV and CaV channels in having an associated subunit with a single transmembrane segment and short intracellular and extracellular domains. It will be intriguing to learn if there is a common function for these similar auxiliary ion channel subunits. The KCa1, 4, and 5 families of channels are associated with one of four auxiliary KCaβ subunits, which have two transmembrane segments and both N and C termini in the cytosol (Fig. 4) (Knaus et al., 1994; Orio et al., 2002). The KCaβ subunits contribute to the binding site for the peptide scorpion toxin charybdotoxin and related channel-blocking agents (Hanner et al., 1997), but their effects on channel function and roles in cell physiology are still emerging in current research (Orio et al., 2002). Unique among the inwardly rectifying potassium channel subunits, the Kir6 subunits that form KATP channels are associated with sulfonylurea receptors (SURs) (Aguilar-Bryan et al., 1995) that are crucial regulators of channel activity (Fig. 4). They are also the molecular targets for the sulfonylurea class of KATP channel blockers, which are used to enhance insulin secretion in therapy of diabetes. The three SUR proteins are members of the ABC transporter family of membrane proteins. They have an amino-terminal domain with five probable transmembrane segments, which is followed by two domains with six transmembrane segments and two ATP binding motifs similar to other members of the ABC transporter family (Bryan and Aguilar-Bryan, 1999). Sequential binding and hydrolysis of ATP at the two nucleotide-binding cassettes regulate Kir6 channel function in response to changes in the concentration and ratio of ATP and ADP and thereby regulate channel activity in response to the metabolic state of the cell. This form of channel regulation is crucial in control of insulin release from the beta cells of the pancreas. Mutations in SUR are responsible for some forms of familial hyperinsulinemia (Thomas et al., 1995). Polycystins (PKDs) 1 and 2 were both discovered as the targets of mutations that cause autosomal dominant polycystic kidney disease (Mochizuki et al., 1996; Chen et al., 1999). PKD2 is an ion channel protein similar in topology and amino acid sequence to TRP channels, whereas PKD1 is an auxiliary subunit that modifies expression and function of PKD2 (Hanaoka et al., 2000). Like SUR, it has a complex transmembrane structure (Fig. 4). Elucidating the functional relationships between PKD1 and PKD2 and defining their roles in normal kidney function is an active area of investigation. The voltage-gated ion channel superfamily is one of the largest families of signaling proteins, following the G protein-coupled receptors and the protein kinases in the number of family members. The family is likely to have evolved from a 2TM ancestor like the bacterial KcsA channel. Additions of intracellular regulatory domains for ligand binding and a 4TM transmembrane domain for voltage-dependent gating have produced extraordinarily versatile signaling molecules with capacity to respond to voltage signals and intracellular effectors and to integrate information coming from these two distinct types of inputs. The resulting signaling mechanisms control most aspects of cell physiology and underlie complex integrative processes like learning and memory in the brain and coordinated movements in muscles. The evolutionary appearance and refinement of these signaling mechanisms are some of the landmark events allowing the development of complex multicellular organisms. The importance of these ion channels in the physiology of complex processes also makes them frequent targets of drugs used in current therapy, and one can predict that the increasing understanding of their structure and function will allow development of novel therapeutic agents for chronic pain, epilepsy, and arrhythmia. ↵1 Abbreviations: VGL, voltage-gated-like; CNG, cyclic nucleotide-gated; HCN, hyperpolarization-activated cyclic nucleotide-modulated; TRP, transient receptor potential; TM, transmembrane; HMM, hidden Markov model; SUR, sulfonylurea receptor; PKD, polycystin; TPC, two-pore channels. Article, publication date, and citation information can be found at http://pharmrev.aspetjournals.org. Abbott GW, Butler MH, Bendahhou S, Dalakas MC, Ptacek LJ, and Goldstein SA (2001a) MiRP2 forms potassium channels in skeletal muscle with Kv3.4 and is associated with periodic paralysis. Cell 104: 217-231. Abbott GW, Goldstein SA, and Sesti F (2001b) Do all voltage-gated potassium channels use MiRPs? Circ Res 88: 981-983. Agnew WS, Moore AC, Levinson SR, and Raftery MA (1980) Identification of a large molecular weight peptide associated with a tetrodotoxin binding proteins from the electroplax of Electrophorus electricus. Biochem Biophys Res Commun 92: 860-866. Aguilar-Bryan L, Nichols CG, Wechsler SW, Clement JP 4th, Boyd AE 3rd, Gonzalez G, Herrera-Sosa H, Nguy K, Bryan J, and Nelson DA (1995) Cloning of the β cell high-affinity sulfonylurea receptor: a regulator of insulin secretion. Science (Wash DC) 268: 423-426. An WF, Bowlby MR, Betty M, Cao J, Ling HP, Mendoza G, Hinson JW, Mattsson KI, Strassle BW, Trimmer JS, et al. (2000) Modulation of A-type potassium channels by a family of calcium sensors. Nature (Lond) 403: 553-556. Anderson PAV, Holman MA, and Greenberg RM (1993) Deduced amino acid sequence of a putative sodium channel from the scyphozoan jellyfish Cyanea capillata. Proc Natl Acad Sci USA 90: 7419-7423. Arikkath J and Campbell KP (2003) Auxiliary subunits: essential components of the voltage-gated calcium channel complex. Curr Opin Neurobiol 13: 298-307. Armstrong CM (1975) Ionic pores, gates and gating currents. Q Rev Biophys 7: 179-210. Armstrong CM (1981) Sodium channels and gating currents. Physiol Rev 61: 644-682. Ashcroft FM and Gribble FM (1998) Correlating structure and function in ATP-sensitive potassium channels. Trends Neurosci 21: 288-294. Barhanin J, Lesage F, Guillemare E, Fink M, Lazdunski M, and Romey G (1996) K(V)LQT1 and lsK (minK) proteins associate to form the I(Ks) cardiac potassium current. Nature (Lond) 384: 78-80. Beneski DA and Catterall WA (1980) Covalent labeling of protein components of the sodium channel with a photoactivable derivative of scorpion toxin. Proc Natl Acad Sci USA 77: 639-643. Bezanilla F (2000) The voltage sensor in voltage-dependent ion channels. Physiol Rev 80: 555-592. Biel M, Schneider A, and Wahl C (2002) Cardiac HCN channels: structure, function and modulation. Trends Cardiovasc Med 12: 206-212. Biel M, Zong X, and Hofmann F (1999) Cyclic nucleotide gated channels. Adv Second Messenger Phosphoprotein Res 33: 231-250. Booth IR, Edwards MD, and Miller S (2003) Bacterial ion channels. Biochemistry 42: 10045-10053. Bryan J and Aguilar-Bryan L (1999) Sulfonylurea receptors: ABC transporters that regulate ATP-sensitive potassium channels. Biochim Biophys Acta 1461: 285-303. Catterall WA (1984) The molecular basis of neuronal excitability. Science (Wash DC) 223: 653-661. Catterall WA (1986) Voltage-dependent gating of sodium channels: correlating structure and function. Trends Neurosci 9: 7-10. 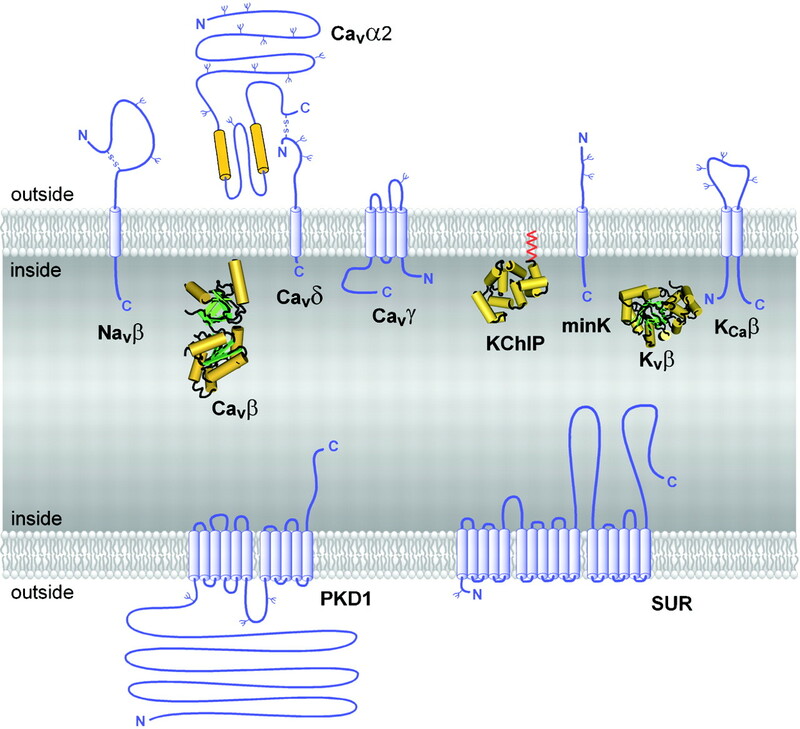 Catterall WA (2000a) From ionic currents to molecular mechanisms: the structure and function of voltage-gated sodium channels. Neuron 26: 13-25. Catterall WA (2000b) Structure and regulation of voltage-gated calcium channels. Annu Rev Cell Dev Biol 16: 521-555. Cha A, Snyder GE, Selvin PR, and Bezanilla F (1999) Atomic scale movement of the voltage-sensing region in a potassium channel measured via spectroscopy. Nature (Lond) 402: 809-813. Chen XZ, Vassilev PM, Basora N, Peng JB, Nomura H, Segal Y, Brown EM, Reeders ST, Hediger MA, and Zhou J (1999) Polycystin-L is a calcium-regulated cation channel permeable to calcium ions. Nature (Lond) 401: 383-386. Chen YH, Li MH, Zhang Y, He LL, Yamada Y, Fitzmaurice A, Shen Y, Zhang H, Tong L, and Yang J (2004) Structural basis of the α1-β subunit interaction of voltage-gated calcium channels. Nature (Lond) 429: 675-680. De Hertogh B, Carvajal E, Talla E, Dujon B, Baret P, and Goffeau A (2002) Phylogenetic classification of transporters and other membrane proteins from Saccharomyces cerevisiae. Funct Integr Genomics 2: 154-170. De Jongh KS, Warner C, and Catterall WA (1990) Subunits of purified calcium channels. α2 and δ are encoded by the same gene. J Biol Chem 265: 14738-14741. Doyle DA, Cabral JM, Pfuetzner RA, Kuo AL, Gulbis JM, Cohen SL, Chait BT, and MacKinnon R (1998) The structure of the potassium channel: molecular basis of potassium conduction and selectivity. Science (Wash DC) 280: 69-77. Ellis SB, Williams ME, Ways NR, Brenner R, Sharp AH, Leung AT, Campbell KP, McKenna E, Koch WJ, Hui A, et al. (1988) Sequence and expression of mRNAs encoding the α1 and α2 subunits of a DHP-sensitive calcium channel. Science (Wash DC) 241: 1661-1664. Glauner KS, Mannuzzu LM, Gandhi CS, and Isacoff EY (1999) Spectroscopic mapping of voltage sensor movement in the Shaker potassium channel. Nature (Lond) 402: 813-817. Goldstein SA, Price LA, Rosenthal DN, and Pausch MH (1996) ORK1, a potassium-selective leak channel with two pore domains cloned from Drosophila melanogaster by expression in Saccharomyces cerevisiae. Proc Natl Acad Sci USA 93: 13256-13261. Gulbis JM, Zhou M, Mann S, and MacKinnon R (2000) Structure of the cytoplasmic beta subunit-T1 assembly of voltage-dependent potassium channels. Science (Wash DC) 289: 123-127. Guy HR and Seetharamulu P (1986) Molecular model of the action potential sodium channel. Proc Natl Acad Sci USA 508: 508-512. Hanaoka K, Qian F, Boletta A, Bhunia AK, Piontek K, Tsiokas L, Sukhatme VP, Guggino WB, and Germino GG (2000) Co-assembly of polycystin-1 and -2 produces unique cation-permeable currents. Nature (Lond) 408: 990-994. Hanner M, Schmalhofer WA, Munujos P, Knaus HG, Kaczorowski GJ, and Garcia ML (1997) The β subunit of the high-conductance calcium-activated potassium channel contributes to the high-affinity receptor for charybdotoxin. Proc Natl Acad Sci USA 94: 2853-2858. Hartmann HA, Kirsch GE, Drewe JA, Taglalatela M, Joho RH, and Brown AM (1991) Exchange of conduction pathways between two related potassium channels. Science (Wash DC) 251: 942-944. Heinemann SH, Terlau H, Stühmer W, Imoto K, and Numa S (1992) Calcium channel characteristics conferred on the sodium channel by single mutations. Nature (Lond) 356: 441-443. Hille B (1972) The permeability of the sodium channel to metal cations in myelinated nerve. J Gen Physiol 59: 637-658. Hille B (1977) Local anesthetics: hydrophilic and hydrophobic pathways for the drug-receptor reaction. J Gen Physiol 69: 497-515. Hirschberg B, Rovner A, Lieberman M, and Patlak J (1995) Transfer of twelve charges is needed to open skeletal muscle Na+ channels. J Gen Physiol 106: 1053-1068. Ho K, Nichols CG, Lederer WJ, Lytton J, Vassilev PM, Kanazirska MV, and Hebert SC (1993) Cloning and expression of an inwardly rectifying ATP-regulated potassium channel. Nature (Lond) 362: 31-38. Hockerman GH, Johnson BD, Scheuer T, and Catterall WA (1995) Molecular determinants of high affinity phenylalkylamine block of L-type calcium channels. J Biol Chem 270: 22119-22122. Isom LL, De Jongh KS, and Catterall WA (1994) Auxiliary subunits of voltage-gated ion channels. Neuron 12: 1183-1194. Isom LL, De Jongh KS, Patton DE, Reber BFX, Offord J, Charbonneau H, Walsh K, Goldin AL, and Catterall WA (1992) Primary structure and functional expression of the β1 subunit of the rat brain sodium channel. Science (Wash DC) 256: 839-842. Isom LL, Ragsdale DS, De Jongh KS, Westenbroek RE, Reber BFX, Scheuer T, and Catterall WA (1995) Structure and function of the β2 subunit of brain sodium channels, a transmembrane glycoprotein with a CAM-motif. Cell 83: 433-442. Jay SD, Ellis SB, McCue AF, Williams ME, Vedvick TS, Harpold MM, and Campbell KP (1990) Primary structure of the gamma subunit of the DHP-sensitive calcium channel from skeletal muscle. Science (Wash DC) 248: 490-492. Jiang Y, Lee A, Chen J, Cadene M, Chait BT and MacKinnon (2002a) Crystal structure and mechanism of a calcium-gated potassium channel. Nature (Lond) 417: 515-522. Jiang Y, Lee A, Chen J, Cadene M, Chait BT and MacKinnon (2002b) The open pore conformation of potassium channels. Nature (Lond) 417: 523-526. Jiang Y, Pico A, Cadene M, Chait BT, and MacKinnon R (2001) Structure of the RCK domain from the E. coli K+ channel and demonstration of its presence in the human BK channel. Neuron 29: 593-601. Jiang Y, Ruta V, Chen J, Lee A, and MacKinnon R (2003) The principle of gating charge movement in a voltage-dependent potassium channel. Nature (Lond) 423: 42-48. Kazarinova-Noyes K, Malhotra JD, McEwen DP, Mattei LN, Berglund EO, Ranscht B, Levinson SR, Schachner M, Shrager P, Isom LL, et al. (2001) Contactin associates with sodium channels and increases their functional expression. J Neurosci 21: 7517-7525. Knaus H-G, Folander K, Garcia-Calvo M, Garcia ML, Kaczorowski GJ, Smith M, and Swanson R (1994) Primary sequence and immunological characterization of β-subunit of high conductance Ca2+-activated K+ channel from smooth muscle. J Biol Chem 269: 17274-17278. Kubo Y, Baldwin TJ, Jan YN, and Jan LY (1993) Primary structure and functional expression of a mouse inward rectifier potassium channel. Nature (Lond) 362: 127-133. Larsson HP, Baker OS, Dhillon DS, and Isacoff EY (1996) Transmembrane movement of the Shaker potassium channel S4. Neuron 16: 387-397. Lesage F, Guillemare E, Fink M, Duprat F, Lazdunski M, Romey G, and Barhanin J (1996) TWIK-1, a ubiquitous human weakly inward rectifying potassium channel with a novel structure. EMBO (Eur Mol Biol Organ) J 15: 1004-1011. Liu Y, Holmgren M, Jurman ME, and Yellen G (1997) Gated access to the pore of a voltage-dependent K+ channel. Neuron 19: 175-184. Long SB, Campbell EB, and Mackinnon R (2005a) Crystal structure of a mammalian voltage-dependent Shaker family potassium channel. Science (Wash DC) 309: 897-903. Long SB, Campbell EB, and Mackinnon R (2005b) Voltage sensor of Kv1.2: structural basis of electromechanical coupling. Science (Wash DC) 309: 903-908. Lopez GA, Jan YN, and Jan LY (1994) Evidence that the S6 segment of the Shaker voltage-gated K+ channel comprises part of the pore. Nature (Lond) 367: 179-182. Loughney K, Kreber R, and Ganetzky B (1989) Molecular analysis of the para locus, a sodium channel gene in Drosophila. Cell 58: 1143-1154. MacKinnon R and Yellen G (1990) Mutations affecting TEA blockade and ion permeation in voltage-activated K+ channels. Science (Wash DC) 250: 276-279. Malhotra JD, Koopmann MC, Kazen-Gillespie KA, Fettman N, Hortsch M, and Isom LL (2002) Structural requirements for interaction of sodium channel β1 subunits with ankyrin. J Biol Chem 277: 26681-26688. McCormick KA, Srinivasan J, White K, Scheuer T, and Catterall WA (1999) The extracellular domain of the β1 subunit is both necessary and sufficient for β1-like modulation of sodium channel gating. J Biol Chem 274: 32638-32646. McGee AW, Nunziato DA, Maltez JM, Prehoda KE, Pitt GS, and Bredt DS (2004) Calcium channel function regulated by the SH3-GK module in beta subunits. Neuron 42: 89-99. Mochizuki T, Wu G, Hayashi T, Xenophontos SL, Veldhuisen B, Saris JJ, Reynolds DM, Cai Y, Gabow PA, Pierides A, et al. (1996) PKD2, a gene for polycystic kidney disease that encodes an integral membrane protein. Science (Wash DC) 272: 1339-1342. Morgan K, Stevens EB, Shah B, Cox PJ, Dixon AK, Lee K, Pinnock RD, Hughes J, Richardson PJ, Mizuguchi K, et al. (2000) β3: an additional auxiliary subunit of the voltage-sensitive sodium channel that modulates channel gating with distinct kinetics. Proc Natl Acad Sci USA 97: 2308-2313. Nagahora H, Okada T, Yahagi N, Chong JA, Mandel G, and Okamura Y (2000) Diversity of voltage-gated sodium channels in the ascidian larval nervous system. Biochem Biophys Res Commun 275: 558-564. Noda M, Ikeda T, Suzuki T, Takeshima H, Takahashi T, Kuno M, and Numa S (1986) Expression of functional sodium channels from cloned cDNA. Nature (Lond) 322: 826-828. Noda M, Shimizu S, Tanabe T, Takai T, Kayano T, Ikeda T, Takahashi H, Nakayama H, Kanaoka Y, Minamino N, et al. (1984) Primary structure of Electrophorus electricus sodium channel deduced from cDNA sequence. Nature (Lond) 312: 121-127. Noda M, Suzuki H, Numa S, and Stühmer W (1989) A single point mutation confers tetrodotoxin and saxitoxin insensitivity on the sodium channel II. FEBS. Lett. 259: 213-216. Opatowsky Y, Chen CC, Campbell KP, and Hirsch JA (2004) Structural analysis of the voltage-dependent calcium channel β subunit functional core and its complex with the α1 interaction domain. Neuron 42: 387-399. Orio P, Rojas P, Ferreira G, and Latorre R (2002) New disguises for an old channel: maxiK channel β-subunits. News Physiol Sci 17: 156-161. Papazian DM, Schwarz TL, Tempel BL, Jan YN, and Jan LY (1987) Cloning of genomic and complementary DNA from Shaker, a putative potassium channel gene from Drosophila. Science (Wash DC) 237: 749-753. Papazian DM, Timpe LC, Jan YN, and Jan LY (1991) Alteration of voltage-dependence of Shaker potassium channel by mutations in the S4 sequence. Nature (Lond) 349: 305-310. Plummer NW and Meisler MH (1999) Evolution and diversity of mammalian sodium channel genes. Genomics 57: 323-331. Pongs O, Kecskemethy N, Muller R, Krah-Jentgens I, Baumann A, Kiltz HH, Canal I, Llamazares S, and Ferrus A (1988) Shaker encodes a family of putative potassium channel proteins in the nervous system of Drosophila. EMBO (Eur Mol Biol Organ) J 7: 1087-1096. Pongs O, Leicher T, Berger M, Roeper J, Bahring R, Wray D, Giese KP, Silva AJ, and Storm JF (1999) Functional and molecular aspects of voltage-gated potassium channel β subunits. Ann NY Acad Sci 868: 344-355. Ragsdale DS, McPhee JC, Scheuer T, and Catterall WA (1994) Molecular determinants of state-dependent block of sodium channels by local anesthetics. Science (Wash DC) 265: 1724-1728. Ratcliffe CF, Qu Y, McCormick KA, Tibbs VC, Dixon JE, Scheuer T, and Catterall WA (2000) A sodium channel signaling complex: modulation by associated receptor protein tyrosine phosphatase β. Nat Neurosci 3: 437-444. Ratcliffe CF, Westenbroek RE, Curtis R, and Catterall WA (2001) Sodium channel β1 and β3 subunits associate with neurofascin through their extracellular immunoglobulin-like domain. J Cell Biol 154: 427-434. Ren D, Navarro B, Xu H, Yue L, Shi Q, and Clapham DE (2001) A prokaryotic voltage-gated sodium channel. Science (Wash DC) 294: 2372-2375. Rettig J, Heinemann SH, Wunder F, Lorra C, Parcej DN, Dolly JO, and Pongs O (1994) Inactivation properties of voltage-gated K+ channels altered by presence of β-subunit. Nature (Lond) 369: 289-294. Ruth P, Röhrkasten A, Biel M, Bosse E, Regulla S, Meyer HE, Flockerzi V, and Hofmann F (1989) Primary structure of the β subunit of the DHP-sensitive calcium channel from skeletal muscle. Science (Wash DC) 245: 1115-1118. Sanguinetti MC, Curran ME, Zou A, Shen J, Spector PS, Atkinson DL, and Keating MT (1996) Coassembly of KVLQT1 and minK (IsK) proteins to form cardiac IKs potassium channel. Nature (Lond) 384: 80-83. Sato C and Matsumoto G (1992) Primary structure of squid sodium channel deduced from the complementary DNA sequence. Biochem Biophys Res Commun 186: 61-68. Sato C, Ueno Y, Asai K, Takahashi K, Sato M, Engel A, and Fujiyoshi Y (2001) The voltage-sensitive sodium channel is a bell-shaped molecule with several cavities. Nature (Lond) 409: 1047-1051. Schoppa NE, McCormack K, Tanouye MA, and Sigworth FJ (1992) The size of gating charge in wild-type and mutant Shaker potassium channels. Science (Wash DC) 255: 1712-1715. Schumacher MA, Rivard AF, Bachinger HP, and Adelman JP (2001) Structure of the gating domain of a calcium-activated potassium channel complexed with calcium/calmodulin. Nature (Lond) 410: 1120-1124. Scott VES, Rettig J, Parcej DN, Keen JN, Findlay JBC, Pongs O, and Dolly JO (1993) Primary structure of a β subunit of α-dendrotoxin-sensitive K+ channels from bovine brain. Proc Natl Acad Sci USA 91: 1637-1641. Srinivasan J, Schachner M, and Catterall WA (1998) Interaction of voltage-gated sodium channels with the extracellular matrix molecules tenascin-C and tenascin-R. Proc Natl Acad Sci USA 95: 15753-15757. Striessnig J, Glossmann H, and Catterall WA (1990) Identification of a phenylalkylamine binding region within the α1 subunit of skeletal muscle Ca2+ channels. Proc Natl Acad Sci USA 87: 9108-9112. Stuhmer W, Conti F, Suzuki H, Wang X, Noda M, Yahadi N, Kubo H, and Numa S (1989) Structural parts involved in activation and inactivation of the sodium channel. Nature (Lond) 339: 597-603. Swofford DL (2003) PAUP*: Phylogenetic Analysis Using Parsimony (and other methods), version 4, Sinauer Associates, Sunderland, MA. Takahashi M, Seagar MJ, Jones JF, Reber BF, and Catterall WA (1987) Subunit structure of dihydropyridine-sensitive calcium channels from skeletal muscle. Proc Natl Acad Sci USA 84: 5478-5482. Takahashi SX, Miriyala J, and Colecraft HM (2004) Membrane-associated guanylate kinase-like properties of β-subunits required for modulation of voltage-dependent calcium channels. Proc Natl Acad Sci USA 101: 7193-7198. Takumi T, Ohkubo H, and Nakanishi S (1988) Cloning of a membrane protein that induces a slow voltage-gated potassium current. Science (Wash DC) 242: 1042-1045. Tempel BL, Papazian DM, Schwarz TL, Jan YN, and Jan LY (1987) Sequence of a probable potassium channel component encoded at Shaker locus of Drosophila. Science (Wash DC) 237: 770-775. Thomas PM, Cote GJ, Wohllk N, Haddad B, Mathew PM, Rabl W, Aguilar-Bryan L, Gagel RF, and Bryan J (1995) Mutations in the sulfonylurea receptor gene in familial persistent hyperinsulinemic hypoglycemia of infancy. Science (Wash DC) 268: 426-429. Thompson JD, Gibson TJ, Plewniak F, Jeanmougin F, and Higgins DG (1997) The CLUSTAL_X windows interface: flexible strategies for multiple sequence alignment aided by quality analysis tools. Nucleic Acids Res 25: 4876-4882. Van Petegem F, Clark KA, Chatelain FC, and Minor DL Jr (2004) Structure of a complex between a voltage-gated calcium channel β-subunit and an α-subunit domain. Nature (Lond) 429: 671-675. Vergara C, Latorre R, Marrion NV, and Adelman JP (1998) Calcium-activated potassium channels. Curr Opin Neurobiol 8: 321-329. Wallace RH, Wang DW, Singh R, Scheffer IE, George AL Jr, Phillips HA, Saar K, Reis A, Johnson EW, Sutherland GR, et al. (1998) Febrile seizures and generalized epilepsy associated with a mutation in the sodium channel β1 subunit gene SCN1B. Nat Genet 19: 366-370. Yang N and Horn R (1995) Evidence for voltage-dependent S4 movement in sodium channel. Neuron 15: 213-218. Yellen G, Jurman ME, Abramson T, and MacKinnon R (1991) Mutations affecting internal TEA blockade identify the probable pore-forming region of a K+ channel. Science (Wash DC) 251: 939-942. Yool AJ and Schwarz TL (1991) Alternation of ionic selectivity of a K+ channel by mutation of the H5 region. Nature (Lond) 349: 700-704. Yu FH and Catterall WA (2004) The VGL chanome: a protein superfamily specialized for electrical signaling and ionic homeostasis. Science STKE 253: re15. Yu FH, Westenbroek RE, Silos-Santiago I, Scheuer T, Catterall WA, and Curtis R (2003) Sodium channel β4: a disulfide-linked auxiliary subunit structurally and functionally similar to β2. J Neurosci 23: 7577-7585. Zagotta WN and Siegelbaum SA (1996) Structure and function of cyclic nucleotide-gated channels. Annu Rev Neurosci 19: 235-263. Zhang M, Jiang M, and Tseng GN (2001) minK-related peptide 1 associates with Kv4.2 and modulates its gating function: potential role as β subunit of cardiac transient outward channel? Circ Res 88: 1012-1019. Zhao Y, Yarov-Yarovoy V, Scheuer T, and Catterall WA (2004) A gating hinge in sodium channels: a molecular switch for electrical signaling. Neuron 41: 859-865. Zhou M, Morais-Cabral JH, Mann S, and MacKinnon R (2001) Potassium channel receptor site for the inactivation gate and quaternary amine inhibitors. Nature (Lond) 411: 657-661.